The following is a quick step by step guide to integrating very basic Steam Achievements into your application in under 10 minutes and under 10 lines of code integrated into your code base. The Steamworks SDK comes with a great example application called Spacewar that shows off the full breadth of Steam features and should be your first stop to see all Steam features in action. 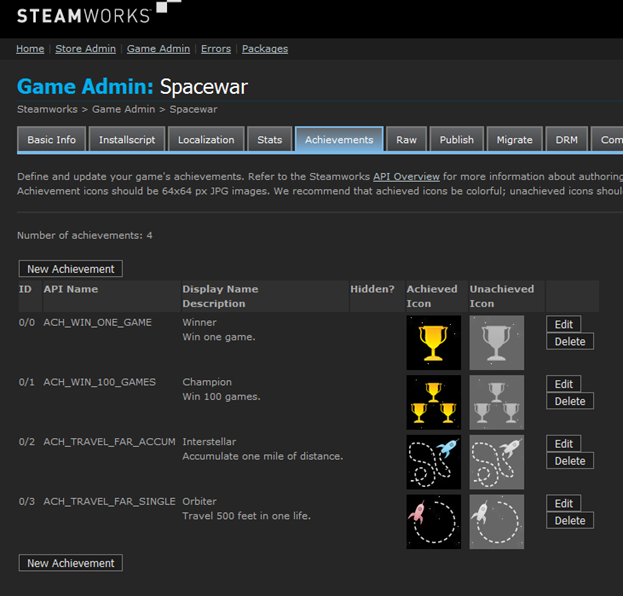 This tutorial distills the information found in Spacewar and the Stats and Achievements API down to just the necessary information required for Steam Stats to keep things as straightforward as possible. Please note that there is a considerable amount of overlap between stats and achievements, as such if you are integrating both be aware that a lot of calls can be consolidated. We first define a structure to hold our achievement data received from steam and provide a macro for creating objects of that type. This data maps directly to what is found on the Achievement Configuration page. Parameters - The constructor takes a pointer to an array of achievements along with the length of the array. The formating of that array will be covered in the main game code later. What it does - The constructor initializes a number of members along with grabbing the AppID we are currently running as. In addition it hooks up the call back methods to handle asynchronous calls made to Steam. Finally it makes an initial call to RequestStats() to get stats and achievements for the current user. What it does - This method basically wraps a call to ISteamUserStats::RequestCurrentStats which is an asynchronous call to steam requesting the stats and achievements of the current user. This call needs to be made before you can set any stats or achievements. The initial call to this method is made in the constructor. You can call it again any time after that if you want to check on updated stats or achievements. Returns - a bool representing if the call succeeded or not. If the call failed then either Steam is not initialized or you still haven't processed the callback from the initial call to RequestStats. You can't set any achievements until that callback has been received. What it does - This method sets a given achievement to achieved and sends the results to Steam. You can set a given achievement multiple times so you don't need to worry about only setting achievements that aren't already set. This is an asynchronous call which will trigger two callbacks: OnUserStatsStored() and OnAchievementStored(). What it does - This method is a callback that is called anytime you attempt to request stats. Stats and achievements are requested by using RequestStats(). The method updates the member variable m_pAchievements to reflect the latest stats and achievement data returned from Steam. What it does - This method is a callback that is called anytime you attempt to store stats on Steam. What it does - This method is a callback that is called anytime Achievements are successfully stored on Steam. The following is the list of includes that are needed to build with Achievements, an enum of our game specific achievements and a global pointer to our helper object. Please note that the achievements match those of the Admin page on Steamworks. The call to SteamAPI_Init initializes all of Steam and must be called before anything else. If that call succeeds then we create the helper object by passing in the array of achievements along with the size of the array.